Finish coatings - providing long-term performance. HEMPATHANE FAST DRY 55750 is a two-component polyurethane paint. Cured with aliphatic isocyanates. Good gloss retention and colour stability. Contains zinc phosphate. 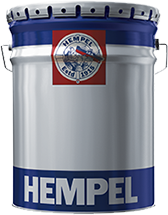 HEMPATEX ENAMEL 56360 is a finishing coat based on acrylic resin and nonchlorinated plasticizer for optimum gloss and colour retention.Resistant to salt water, splashes of aliphatic hydrocarbons and animal and vegetable oils.